Made with ultralight Dynex (Dyneema) fabric, the Black Diamond Cirque 30 is a workhorse pack for bigger daily missions. Although less voluminous than the 35, it has enough usable space and extensions to handle just about anything, including the Grand Traverse race. The Cirque line features a slick lid closure system that is fast to operate with one hand, even blindfolded (why are you skiing blindfolded?). 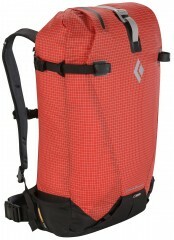 The packs have tuck-away axe and ski carry straps and an optional lid extension for impressive expandability. The Cirque 30 is a lightweight, streamlined ski pack with enough storage for most folks on most days. Smaller size and simplified hip belt means 30% lighter than the Cirque 35. 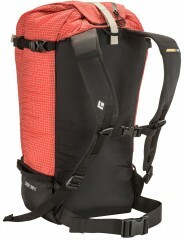 Form-fitting suspension has adjustable straps and a rugged webbing belt. CINCH closure is a unique drawstring system for quick lid opening/closing. Integrated avalanche gear pocket has drain holes to relieve water weight. Diagonal and A-frame ski carry loops can be tucked away for streamlining. Ice-tool PickPockets™ feature a quick-deploy system for quick-picking. Tuck-away rope strap allows external carry of those space-eating cords. Back-panel insert is a comfortable foam that is removable for light days. Compatible with the AvaLung Element for additional avalanche safety. Optional lid extension adds even more options for carrying gear. I'm 5'8'', 150 lb, guy. What size pack would you recommend? Hi Albert, I think that at 5'8" you will find a more comfortable fit in the M/L.